1. When Was The Paleocene? Cross section of a deep seabed core showing the die off of minute sea creatures - the dark top section above the lower white calcite section - due to the increased acidity of the oceans caused by increased concentrations of CO2. Explanation below. Though microscopic, single-celled animals called Foraminifera form their shells from calcium ions and carbon dioxide in the ocean, their remains are the basis of much of the world's limestone rocks. Many sea creatures such as foraminifera, coccoliths (algae), corals, diatoms and shellfish rely on secreting calcite taken from seawater molecules to form their shells and any internal structures. Where these foraminifera are abundant, when they dies they fall to the sea floor and their gradually their shells decay and form thick layers of calcite ooze on the seafloor, this is generally a pale white in colour. (As limestone and chalk rocks are also white, and formed from the same material in the same way.) Where there is an extinction event this shows up by pronounced calcite free reddish layers. There's a change in the strata, in both rocks and seabed cores. Although insoluble in ordinary water the calcium carbonate mineral - CaCO3 - dissolves in acidic carbonic solutions. Increasing the acidity of the oceans leads to fewer carbonate ions. By reducing the quantity of these raw materials, it slows the speed at which these creatures produce their calcite shells, making them less healthy, prone to dissolution and predators. The PETM also shows clearly in the strata by a drop in the levels of the heavy carbon-13 (C-13) isotope compared with the lighter carbon-12 (C-12) isotope. Stable isotope results from carbonate and organic materials from many different sites at sea and on land, from the tropics to the poles, all show a marked decrease in the ratio of C-13 / C-12, indicating the initiation of the PETM and increases in CO2 concentrations. Geologists call this drop in the amount of heavy carbon isotopes a carbon isotopic excursion or CIE. 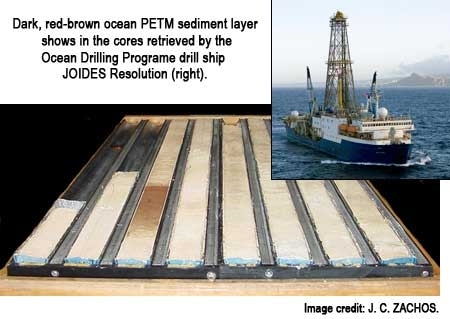 The PETM's carbon isotopic excursion (CIE) - the increase in the ratio of light to heavy carbon isotopes found in rocks and fossils - is so distinctive it is now used across the world by geologists and oceanographers to date the origin of rocks and fossils. Next section: 1. When Was The Paleocene?